Leigh and I were invited to the Southend Raspberry Jam last Saturday to help out with the running of a couple of workshops. It was a fantastic day with absolutely loads to see and awesome lectures, exhibits and workshops spread around the Tickfield Centre in Southend, Essex. Though Raspberry Jams primarily tend to target the Raspberry Pi enthusiast demographic (hence the event name), the wonderful thing about the Southend Raspberry Jams is the fact that it’s incredibly inclusive of a whole range of different geeky, techy interests. Whether you’re into the Raspberry Pi or not, you’re sure to fall in love with something at the Southend Raspberry Jam. Learning to Code “My First Web Page”…. Leigh spent the day teaching basic HTML and CSS coding, helping children and anyone else interested in learning web programming to create their very first web page. Starting with the basic web page templates (<html>, <body>, etc) to get their first Hello World page up, all the way to including images, headings and basic CSS styling so that people could play around with element positioning, font colours and background colours. Though the results may seem extremely basic, these are the vital first steps for any beginner to get going with making their first website. Armed with nothing but a web browser and a no-thrills text editor, you can start piecing together bits of basic web mark-up code to construct unique websites unlike any other. Hopefully Leigh’s introduction to web fundamentals left some young people feeling inspired to go home and develop their own amazing websites! Whilst Leigh was busy teaching kids how to code their very first web page, I was on the other side of the room playing Minecraft! Or, more accurately, teaching kids basic Python programming using the Minecraft API to get them excited about coding using a game that’s already extremely popular with children of all ages (myself included). Like Leigh, I started them off on coding their very first Hello World program, that displays the text within the Minecraft game. Then these clever kids quickly learnt how to program 3D structures in Minecraft, and randomly generated coloured blocks that built a rainbow pathway below them as they flew around the Minecraft world. It’s amazing how quickly they were able to pick up if/else conditional statements and while loops so soon after they had only just familiarised themselves with the very basic Python syntax. The Minecraft workshop used snippets of the new kids coding book, Adventures in Minecraft by David Whale, to give the young children an opportunity to combine two awesomely fun things: coding and gaming. A massive Thank You to the organisers of the Southend Raspberry Jam and the Southend Linux User Group for holding such extraordinary events for the community. Can’t wait for the next one! 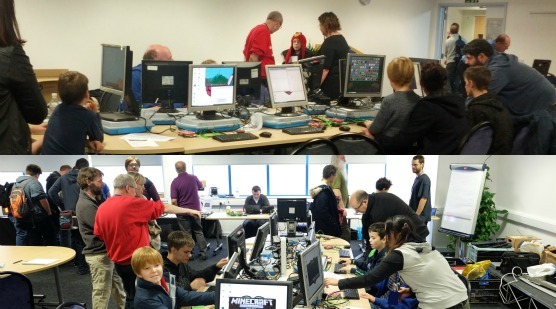 Check out what else was at the November Southend Raspberry Jam!